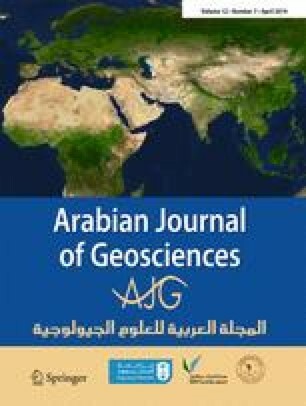 The processing and analysis of airborne geophysical data for polymetallic mineralization in Aghkand area at East Azerbaijan Province (NW Iran) were carried out with a view to establishing the prospective mineralized zones. This was done in two stages: (i) The magnetic and radiometric data were used to produce different maps including total magnetic intensity (TMI), reduction to the pole (RTP), magnetic lineation, intrusive, ternary, alteration, and other maps as well as the updated geological map of the area which when correlated with the geological map shows the concentration of potential areas at the western part; and (ii) the fractal model of concentration-area (C-A) was applied to find the main anomalous areas of RTP map, and the results were checked with geological units. The main anomalous areas in the RTP map were found from the western to the southwestern part of the area, consisting of andesite, tuffs, and dacite rocks. For validation purposes, the log-ratio matrix was used to correlate the main anomalous areas derived from the RTP map with mineral potential map. The prospective map of potential polymetallic mineralization was developed through integration of different exploration datasets using step-wise weight assessment ratio analysis (SWARA). The overall accuracy rate of RTP map when correlated with mineral potential map is 99%. Results are in good compliance with airborne geophysics data and indicate the presence of intrusive masses which is probably located in the western part of the study area. The authors would like to thank Mahdi Panahi because of his help and his constructive and valuable advice on integration of the discovered layers.